Here's my card for the current Global Design Project challenge. 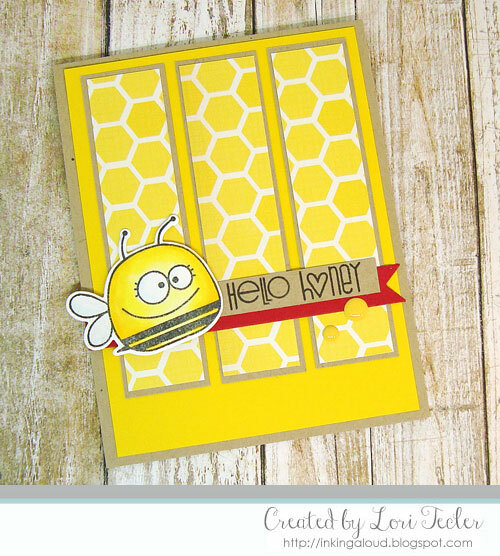 I paired the sketch with one of my favorite Paper Smooches stamp sets for this sweet design. I'm also sharing this card for this month's Paper Smooches Anything Goes challenge. I colored up a bee from the Bee Mine stamp set using Copic markers. After cutting out the image with the matching die, I added a bit of sparkle to the bee's wings with a clear glitter brush pen. For the background, I cut three strips of honeycomb patterned paper. The strips were adhered to kraft mats, then arranged on a yellow cardstock panel. For contrast, I adhered a red fishtail flag strip across the panel. It was topped with a kraft strip stamped with the set's "hello honey" sentiment. I added the bee to the left side using foam tape for dimension, then added a pair of yellow enamel dots as an accent. The finished panel was adhered to a yellow card base.